Hp Pavilion Dv5-1120ej. Hp Pavilion Dv5-1120ek. Hp Pavilion Dv5-1103ax. Hp Pavilion Dv5-1110ea. Hp Pavilion Dv5-1108eg. Hp Pavilion Dv5-1108ea. Hp Pavilion Dv5-1102el. Hp Pavilion Dv5-1104ef. Output: DC 19V. Connector size: 5.5 x 1.7mm. Colour: Black. Rated Power: Max 90W. EVO N1000C,EVO N1000V,EVO N1005V,EVO Notebook N1000C,EVO Notebook N1000VN110,N150,N200,N400,N400c,N410c,N600,N600c,N610c,N620c,N800,N800c,N800v,N800w,N1000,N8000HP. 1 x GENERIC UK Cloverleaf Cable. EVO Series. 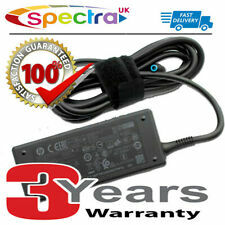 Genuine HP Laptop Charger Blue pin 19.5V 3.33A Original HP Pavilion Sleekbook. Condition is Used. Dispatched with Royal Mail 1st Class. 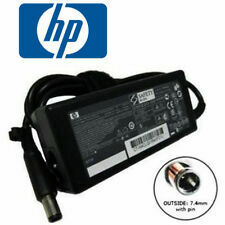 Laptop AC Adaptor HP-AP091F13P 19V 4.74A or LCD monitor. HP Laptop Mains Adaptor. GENUINE HP. USED IN GOOD CONDITION. AS IM WILLING TO 100% COMMUNICATE AND. IS DIFFERENT! UK MAINLAND. IF OUT SIDE THE. UK MAINLAND ONLY. SORT OUT THE ISSUE STRAIGHT AWAY. Output: 19.5V 3.33A 65W. 1 x AC Power Adapter. Color: Black. PPP009H 18.5V 3.5A 65W 534092-002. YELLOW TIP. USED IN GOOD CONDITION HOWEVER. AS IM WILLING TO 100% COMMUNICATE AND. WILL BE VOIDED. UK MAINLAND ONLY. SORT OUT THE ISSUE STRAIGHT AWAY. GRAB YOUR SELF A BARGAIN . 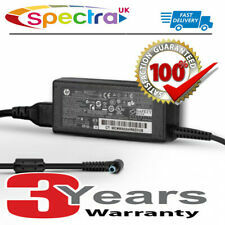 Genuine Original HP 19.5V 2.31A 45W Laptop Charger AC Power Adapter. Condition is Seller refurbished. Dispatched with Royal Mail 1st Class. Output: 19.5V 2.31A 45W. 1 x AC Power Adapter. Power: 120 Watt. Connector size: 7.4mm external x 5.0mm Internal, central pin. (Standard HP round pin 'Smart' adapter.). Sold as the power adapter only (as pictured). A mains power cable is NOT included (requires standard 3 pin 'clover-leaf' IEC C5 power cable). Genuine hp product. For model no please see pictures and make sure this fits to your laptop. 19.5V 3.33A 65W PPP009C 677774-002\. USED IN GOOD CONDITION HOWEVER. AS IM WILLING TO 100% COMMUNICATE AND. IS DIFFERENT! UK MAINLAND. IF OUT SIDE THE. UK MAINLAND ONLY. SORT OUT THE ISSUE STRAIGHT AWAY. Hp Pavilion Dv5-1120ej. Hp Pavilion Dv5-1120ek. Hp Pavilion Dv5-1102tx. Hp Pavilion Dv5-1102tu. Hp Pavilion Dv5-1102et. Hp Pavilion Dv5-1102el. Hp Pavilion Dv5-1102ax. Hp Pavilion Dv5-1101tx. 1040 G3, 2570, 725 G2, 725 G3, 745 G2, 820 G1, 820 G2, 820 G3, 820 G4, 830 G5, 840 G2, 840 G3, 840 G4, 840 G5, 840r G4, 850 G5; EliteBook Folio 1020 G1, 1040 G2; EliteBook Revolve 810 G2; EliteBook x360; ProBook 430 G1, 430 G2, 430 G3, 640 G4, 645 G1, 645 G3, 64X G2, 650 G4; ZBook 14 Model HP Slim Product Type Power adapter Device Type Power adapter - external LocalisationEnglish / United KingdomPower. Condition is Used. No Power Lead included. 18.5V 4.9A. ORIGINAL HP Compaq 610 Laptop Adapter Charger GENUINE Power Cable Yellow Pin Tip. Condition is Used. Hp Pavilion Dv5-1120ej. Hp Pavilion Dv5-1120ek. Hp Pavilion Dv5-1103ax. Hp Pavilion Dv5-1102tx. Hp Pavilion Dv5-1102tu. Hp Pavilion Dv5-1102et. Hp Pavilion Dv5-1102el. Hp Pavilion Dv5-1102ax. HP Pavilion 14-b000. HP Pavilion 14-b002eo. HP Pavilion 14-b002sa. HP Pavilion 14-b002sx. HP Pavilion 14-b003ea. HP Pavilion 14-b003sa. HP Pavilion 14-b003tx. HP Pavilion 14-b004tx. Hp Compaq Cq70-103tu. Hp Compaq Cq20-105tu. Hp Compaq Cq60-105eb. Hp Compaq Cq70-103tx. Hp Compaq Cq70-104tx. Hp Compaq Cq60-105ef. Hp Compaq Cq70-105eb. Hp Compaq Cq70-105ef. HP Compaq HP ZBook 14 G2 Series. HP Compaq HP ZBook 14 Series. HP Compaq HP ZBook 15 Series. HP Compaq HP ZBook 15u G2 Series. HP Compaq HP ZBook 17 G2 Series. HP Compaq HP ZBook 17 Series. HP 14 ZBook (E2P25AV). Power 65 Watt. DC Pin Size: 4.5mm X 3.0mm (Blue Tip With Pin Inside). 100% compatibility with the original. one year warranty included. Output Current: 3.33A. This is a used item so it may be dirty / very dirty / faded / yellow'ish / scratched / liquid marked / rusty and or have stickers / tape marks so it will not be in its original condition, if it's a multiple the one photographed may not be the one you receive. HP Pavilion 15-n20xxx Notebook PC Series HP Pavilion 15-n21xxx Notebook PC Series. HP Pavilion 15-n22xxx Notebook PC Series HP Pavilion 15-n23xxx Notebook PC Series. HP Pavilion 15-n24xxx Notebook PC Series HP Pavilion 15-n25xxx Notebook PC Series. GENUINE HP LAPTOP ADAPTOR 740015-004. BLUE COLOUR CODED TIP. FREE LOCAL PICK UP AVAILABLE. Compaq Presario 900 Series. Compaq Presario 2800 Series. Compaq Presario M2000 Series. Compaq Presario V1000 Series PC. Compaq Presario V2000 Series. Compaq Presario V2100 Series. Compaq Presario V2200 Series. Condition is used. Usual wear and tear. Power: 120 Watt. Sold as the power adapter only (as pictured). A mains power cable is NOT included (requires standard 3 pin 'clover-leaf' IEC C5 power cable). HP Pavilion ZD7000. HP Pavilion ZV5000. 1st CLASS DISPATCH! FREE POWER LEAD! 1 YEAR WARRANTY! USED CONDITION. TESTED & WORKING. POWER BRICK ONLY. NO LEAD CABLE INCLUDED. TESTED WORKING.